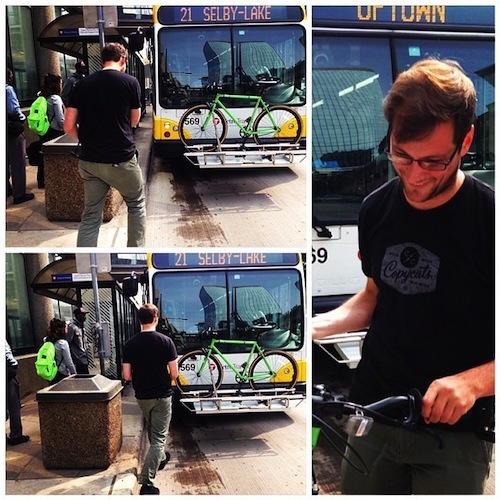 Have you ever wondered what’d happen if you left your bike on a Metro Transit bus rack? The first thing is, you’ll panic — with a painful, embarrassing epiphany. “OMG, I got off the bus and walked away from my bike! I stranded it there, on the rack, and who knows where it is now.” The second thing that’ll happen (hopefully) is you’ll call Metro Transit (612-373-3333), and they’ll be like, “Chill out, man. We’ll save you. The bus that you took is looping back around and it’ll be in your area in 10 minutes. Walk to this intersection and meet it.” Third, you’ll walk to that intersection and, with your face red and your pride bent, and with a bus driver obviously giggling at your expense, you’ll rescue your favored steed from the rack and bring it to safety. That all happened to my friend Adam Babel this morning, and as much as it was an "OH NO!" moment, it was also a “Wow, Metro Transit is awesome!” kind of moment, a day rescuer for a multi-modal gent. Hooray for bikes and buses! Patrick Stephenson is a copywriter at Minnesota Public Radio and the director of 30 Days of Biking. Follow him on Twitter, @patiomensch, where he tweets like 5,000 times a day. Just a random bike ride, to a parking lot in St. Louis Park. Where has summer gone? It's pedaled away from us. Bike 24 hours in a row, Powderhorn style. Sign-up ends Sunday for the Powderhorn 24. A celebration of bicycling moms from Pedal Minnesota. The author's bachelor party was this past weekend, and he rode his bike.